On curves, the smart cruise control system may not detect a moving vehicle in your lane, and then your vehicle could accelerate to the set speed. Also, the vehicle speed will rapidly down when the vehicle ahead is recognized suddenly. Select the appropriate set speed on curves and adjust your vehicle speed by depressing the accelerator or brake pedal according to the road condition ahead and driving condition. Your vehicle speed can be reduced due to a vehicle in the adjacent lane. Adjust your vehicle speed by depressing the brake pedal according to the road condition ahead and driving condition. Apply the accelerator pedal and select the appropriate set speed. 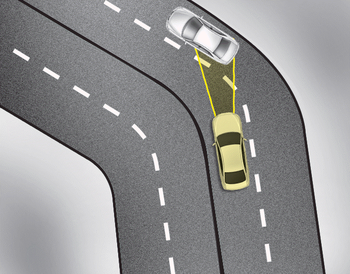 Check to be sure that the road conditions permit safe operation of the smart cruise control.